Cryo-SEM is a well-established method used mainly for the investigation of aqueous samples, be it of biological or artificial origin. Conventional chemical fixation methods require the removal of water, the main constituent of most aqueous samples, and often result in various artifacts. In contrast, during preparation for cryo-SEM observation, samples are subjected to minimal physical perturbation, e.g. solidification upon fast cooling, fracturing, mild water sublimation (“etching”) and, optionally, surface coating with metal vapor. These processes provide the ability to directly observe samples in their original, albeit frozen, hydrated state. 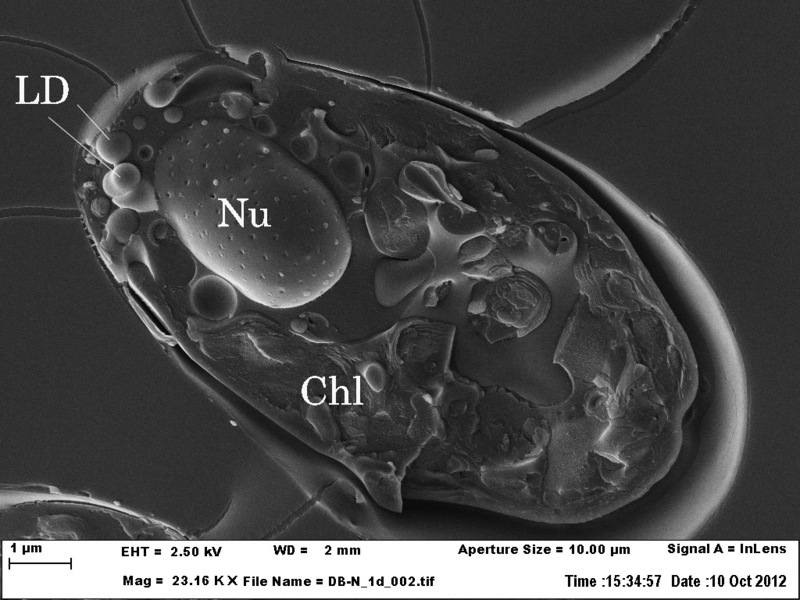 A cryo-SEM image of Dunalliella bardawill, a unicellular alga. The sample was frozen under high pressure, freeze fractured and observed in a scanning electron microscope while being kept at low temperature. The nucleus (Nu) with its nuclear pores is apparent as well as lipid droplets (LD) and the chlloroplast (Chl).